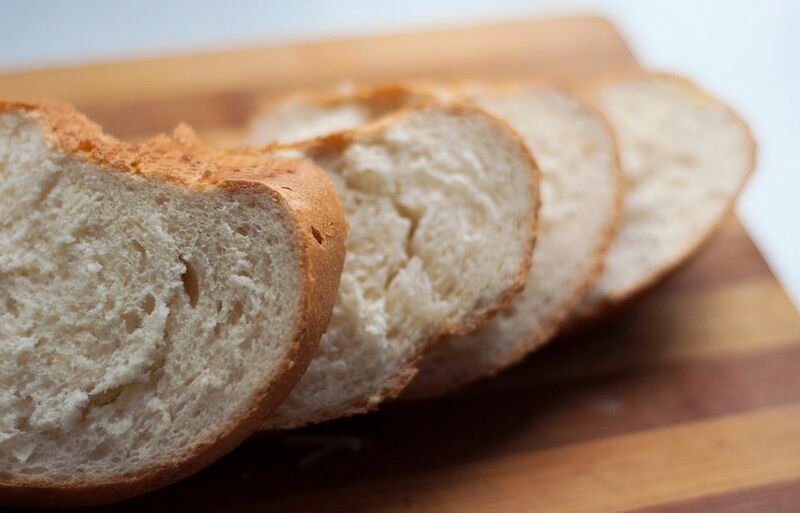 Italian-style and French-style bread is very common in Poland and the rest of Eastern Europe. But they are not always the crispy artisan affairs most people associate with these breads. Włoski Chleb (VWOHSS-kee HLEP), literally "Italian bread," would probably be referred to simply as bagietka or baguette in Poland, where there is a thriving artisan bread-making industry that focuses on whole-grains, seeds, and nuts. The upside of this no-egg recipe is that it can be made with whey, the byproduct of the cheesemaking process. See more about cheesemaking, below, after the recipe directions. The whey gives the crumb of this soft bread a yellow color. If water or milk is used, the crumb will be whiter. This bread can also be considered a Vienna-type bread. In a medium bowl or stand mixer bowl, stir together yeast, sugar, and 3/4 cup warm whey until yeast is dissolved. Set aside until yeast begins to proof or becomes bubbly. Meanwhile, melt butter in 1 cup hot whey, and allow to cool to 115 F. Transfer to yeast mixture and mix well. Add salt and flour, 1 cup at a time, with a Danish dough whisk, wooden spoon or dough hook until dough comes away from the sides of the bowl. Knead on a lightly floured surface, adding more flour if necessary, or knead with the dough hook in a stand mixer until dough is soft and smooth about 2 to 4 minutes. Cover and let rest 6 minutes. Place parchment paper on a large baking sheet and sprinkle with cornmeal. Divide dough into two equal pieces. Roll each piece on a lightly floured surface into a 12x8-inch rectangle. Starting at the 12-inch end, roll dough tightly, turning ends under slightly and rounding ends. Transfer to prepared baking sheet and cover with greased plastic wrap. Let rise until doubled, about 50 to 60 minutes. Heat oven to 425 F. Brush loaves with egg white and, if you desire, slash them with a sharp knife, razor blade or lame either down the center or in diagonal rows. Bake 30 to 40 minutes or until an instant-read thermometer registers 190 F and loaves are a rich, golden color and sound hollow when you tap the top with your knuckles. Cool on a wire rack. Let cool completely before slicing and serving along with your favorite recipe or simply with butter and jam. This bread freezes well. If you've ever made cheese at home, you know that milk is heated with some type of acid and sometimes rennet, an enzyme that makes milk proteins coagulate. The milk separates into curds and whey. The curds are the solid cheese and often the whey, or liquid portion, is thrown away but not in the frugal kitchens of Europe. Whey can be used to make soups, bread, anything that requires a slight tang like krupnik (Polish barley soup).